Where? Craft beer popularity continues to grow all around the Sunshine State, and although the Tampa area may get the most attention, it’s time to take a look at the craft beer movement in Jacksonville that's been steadily gaining steam. 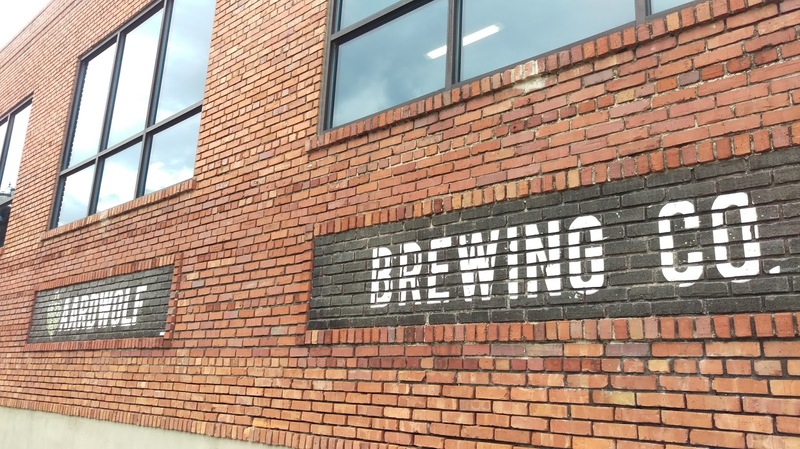 After all, Jacksonville (known as "Jax") is home to eight craft breweries, a macro brewery, three established brewpubs, and at least two more breweries in the works. Jacksonville is the largest city in the US in terms of square miles. It's home to the Jacksonville Jaguars and the St. Johns River, one of only two northward-flowing rivers. And, nearby Jacksonville Beach provides the area with a laid-back, yet eclectic, beach and surfing scene. Generally, Jax is divided into different named sections. 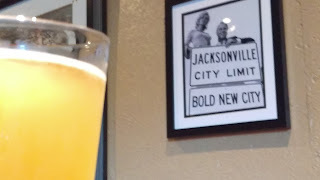 And, although they are separate municipalities, the cities of Jacksonville Beach and Orange Park are generally included in the Jax craft brewery mix, too. As a local beer blogger, beertender and brewery tour guide, I get to talk about beer and the area breweries, in addition to making regular visits ... and, doing some tasting! It's all part of the job (really, it's work; but, yeah, it's pretty cool). So, let's take a tour of what Jacksonville has to offer the craft beer enthusiast, beer traveler, and the craft beer newcomer alike. Each brewery is quite different from the other, and there’s something here for everyone! If you're just getting to know the Jax breweries, you might want to start with an online visit to the Jax Ale Trail. An award-winning initiative of area tourism bureau Visit Jacksonville, the Jax Ale Trail provides an overview of the local breweries in an interactive way. Pick up your Jax Ale Trail Passport at any of the eight participating breweries or the downtown visitor center, and as you visit each brewery, get that passport stamped. 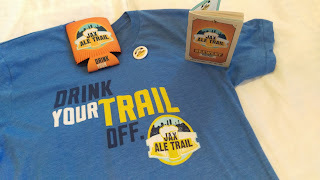 Obtain four stamps, and you'll earn a specially-designed Jax Ale Trail koozie. Get all eight, and you'll be rewarded with a logoed t-shirt. Just outside of downtown Jacksonville across the river are the Riverside, Five Points and San Marco areas, several of the "hottest" parts of town, featuring walkable sidewalks lined with shops, restaurants and bars. 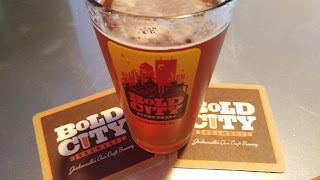 BOLD CITY BREWERY Riverside is home to Jax's "oldest" and largest craft brewery, Bold City Brewery. Inspired by the city's moniker "Bold New City of the South," the brewery urges everyone to "Be Bold." 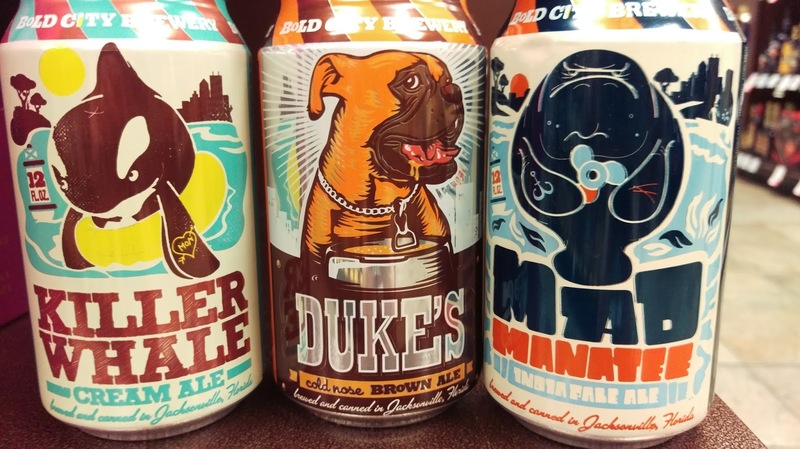 Walk into almost any local bar or restaurant around town, and you’re likely to find at least one of the three Bold City core beers: Killer Whale Cream Ale, Duke’s Cold Nose Brown Ale, Mad Manatee IPA. highly recognizable and extremely popular around Jax. 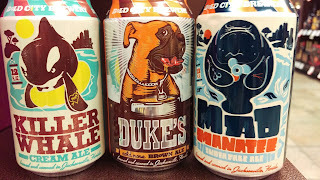 The Duke’s label features a likeness of the family’s late beloved pet boxer, Duke. If a refreshing, lighter beer with no hop bitterness is more your style, check out Killer Whale Cream Ale (5.5%). It’s a go-to beer for many, and goes with anything. 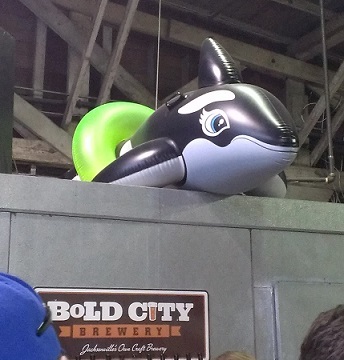 You can always find Killer Whale watching over things at the brewery. The Mad Manatee IPA (6.5%) offers a hop bite along with floral and citrus flavors. And, note the artwork here: it’s a tribute to the Florida manatee and its struggles with boats. Bold City launched in 2008 when mother and son duo Susan and Brian Miller decided to say goodbye to their “day jobs” at an insurance company and pursue a life of malt and hops. Brian had also homebrewed since 2002 and realized his true calling. When you drive up to the brewery, you may not immediately know what it is. Situated in a warehouse next to railroad tracks, the brewery now houses the biggest tanks in Jax. The 20-barrel brewhouse is complemented with these big boys: three 40-barrel fermenters, one 80-barrel fermenter and, one 120-barrel fermenter. Keeping those tanks company are three brite tanks, holding 40, 80 and another 120 barrels in each. The brewery took delivery of those 120’s last year. Look outside, and you’ll see the brewery’s two grain silos, the only ones in town. Demand for Bold City beer is high, as the brewery produces reliable and consistent beer, enjoyed by both craft newbies and regulars. 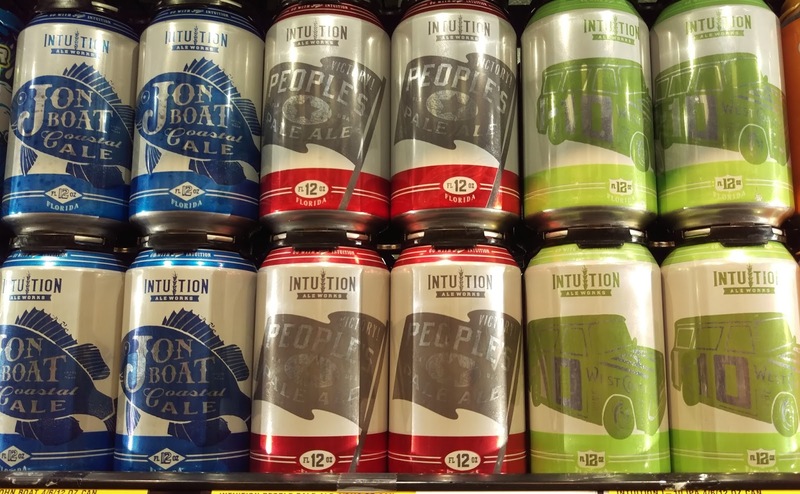 Bold City started canning its beers onsite in July 2013, and the three core beers are readily available in virtually every local grocery and liquor store. In addition to the Jax/North Florida area, the distribution also extends to Tampa, Sarasota, Daytona, Orlando and Gainesville. If you want to taste the beers “at the source,” visit the Bold City tap room, open Thursday to Saturday. The tap room is reminiscent of a cozy inn. It offers the core beers, plus additional house beers such as Archie’s Rhino Rye Pale Ale (one of my favorites), named after the white rhino at the Jacksonville Zoo. Be on the lookout for Roxy’s Finest Imperial Cream Ale, 1901 Red Ale (a roasty, smoky red ale named after the Great Fire of Jacksonville in 1901), Big John’s Apricot Wheat, Fritz Hefeweizen, Secret Stout, and seasonals like Oktoberfest or Pumpkin Ale. Every so often, the brewers release a few surprises, such as cask beers or special treatments of Killer Whale or Duke’s (the almond coconut version last fall was a special treat). An onsite kitchen staffed by LaBodega features Cuban and finger foods. Stop by when one of the local bands plays in the brewhouse, and your feet will be tapping right along with that beer. “Firewater Fridays” are hugely popular once-a-month foot-stomping nights when local band Firewater Tent Revival appears. And, if you’d like to get a look at how the beer is made, take a brewery tour on Saturdays between 2-5pm. In late 2015, Bold City announced plans to expand operations by building a new, smaller brewhouse and tap room in downtown Jax on Bay St. Anticipated to open in Fall 2016, the new digs will feature a 3-barrel brewhouse and will produce small and experimental batches. 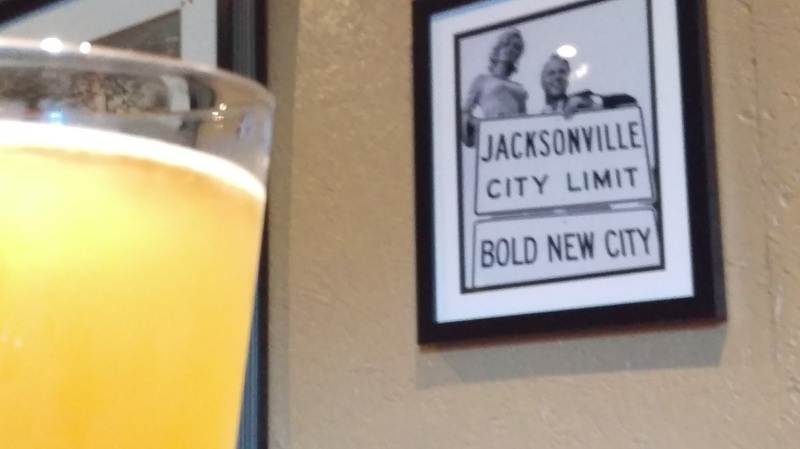 All of the Jax breweries are active in charitable events, and Bold City is no exception. The brewery regularly hosts events onsite and is a sponsor or featured brewery at other local fundraisers (many for animal welfare groups), such as the recent Toast to Conservation at the Jacksonville Zoo, which included the above-mentioned white rhino, Archie. You’re sure to have a fun time at Bold City Brewery! Next up, we only have a very short trek to our second brewery stop …. INTUITION ALE WORKS Literally just over the tracks in the Riverside area is Intuition Ale Works, founded in 2010 by local entrepreneur Ben Davis, who applied his coffee and wine background to the craft beer biz. Here’s another large production brewery that hasn’t had a shiny storefront, but it’s what’s inside that counts. The first time I visited, I drove right by. 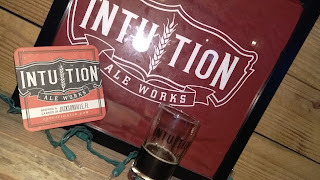 And, inside, Intuition has been producing a combination of popular core beers, one-offs, and its annual celebrated February release of the highly sought-after Underdark Imperial Stout (there’s even an annual all-day blockbuster of a party). The 2016 version of Underdark was aged in whiskey barrels. The tap room is cozy and comfortable, and the bartending staff is friendly and knowledgeable. It’s always a popular stop on the bus. Find one of the 20 beers on tap on one of the two chalkboards on either side of the tap room. The four core beers are tried and true, and the brewers always seem to release new beers that are a bit out of the ordinary, from saisons to barrel-aged. Stop by the tap room on One-Off Wednesdays for a special treatment of one of the core beers or a special release. 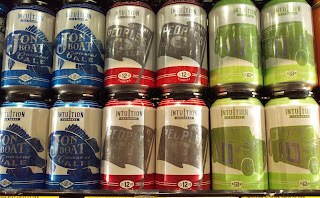 In February 2012, Intuition was the first brewery in the state to start canning its beers on its current 10-barrel system. The brewery has regularly canned four of its main beers, which are available just about everywhere in the Jax area: Jon Boat Coastal Ale (lager-like golden ale that’s a go-to lighter beer), People’s Pale Ale (citrusy and hoppy pale ale), I-10 IPA (a hoppy IPA featuring four hops), and King St. Stout (an oh-so-smooth imperial stout that’s one of my favorites here). Recently added to the canning line is Easy on the Eyes (citrusy Session IPA). Intuition’s beers are regularly found on draft all around town and are distributed throughout Central and North Florida. The tap room offers a variety of house beers, and at any given time, you’re likely to find a kolsch-style ale, several Belgian ales, black, red and brown ales and others. Recently, Intuition tapped Knothead Alt, a malty, easy to drink altbier that I enjoyed so much I made a point of bringing it to the attention of the riders on my bus tour last weekend. Another new tapping you’ll want to try is the Wheelhouse Dark Brown Ale, a toasty and nutty ale made with rye for a bit of spiciness. And, when Intuition throws an anniversary party, it does so on a grand scale. 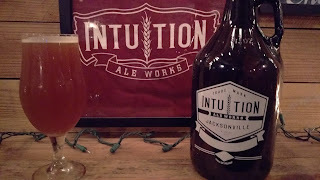 For its fifth anniversary all-day party last November, in addition to featuring two bands and food trucks, Intuition offered just under 50 house beers on tap, including core beers, special treatments, familiar re-releases and more. Lately, however, the big news surrounding Intuition Ale Works has been the construction of its new brewery and tap room in downtown Jacksonville, adjacent to the sports complex and Veterans Memorial Arena. Work is underway, and when completed, Intuition will move its operations to the new location (over 20,000 square feet of leased space). With the new location also comes an increase in brewing capacity, in the form of a new 30-barrel brewhouse. The brewery will be neighbors with Manifest Distilling, also under construction on the property. An opening by Fall of this year is anticipated, much to the joy of sports fans and concert attendees (including yours truly). Get ready for that Sixth Anniversary party, because it promises to be one major event. And, about that shiny storefront? I don’t think anyone will have any trouble finding it. 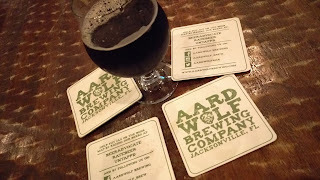 AARDWOLF BREWING COMPANY burst on the beer scene in early 2013, and its 15-barrel brewhouse produces a wide variety of beer styles, from sours to IPAs to Brown Ales to imperial stouts to barrel-aged and everything in between. In that short time, the brewery has earned eight competition medals, including a Bronze Medal at GABF 2015 (Great American Beer Fest) for its Belgian Pale Ale (malty pale ale with Belgian yeast), and a Bronze at this year’s Best Florida Beer Championships for its San Marco Sour (sour blonde ale). A couple of the most unique beers you’re likely to find in the city just may be Aardwolf’s Lactic Zeppelin, a Berliner Weisse with the funk of Brettanomyces, and Hipster Popsicle, a cherry lime gose. The building was home to a municipal ice plant dating back to the 1920’s and then a tile factory. 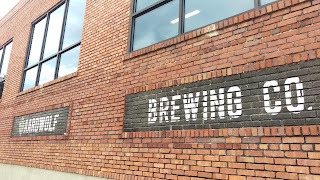 Each of these is evident: The interior includes the brick wall from the ice plant days, and the exterior features the brewery name in a brick and tile-like format. What about that name, anyway? The “aardwolf” is an insectivorous, nocturnal mammal native to Africa. The name means “earth wolf,” or as the brewery explains it, “humulus lupulus,” for a hoppy beer connection. Need proof? 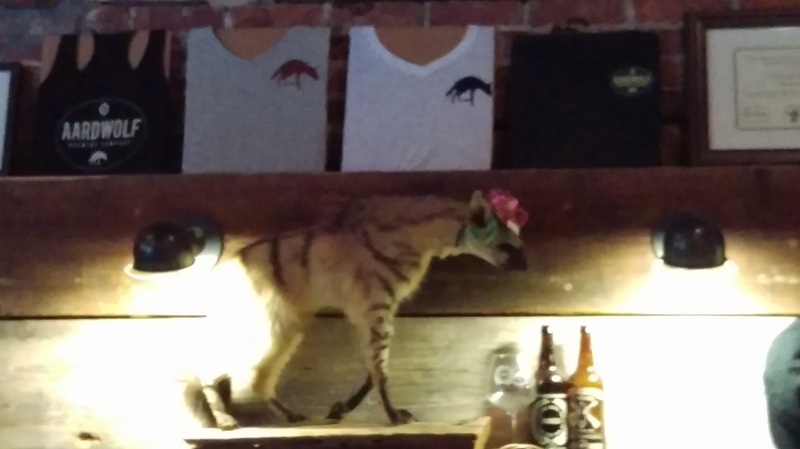 Take a look at the brewery’s mascot, Alvin, who always is perched over the bar. Alvin is also known to sport apparel coincidental with holidays, so be on the lookout. While you’re always likely to find a few Belgian style beers on tap, the variety among the 20 or so taps can be intriguing. Add to that a pilot batch released every Wednesday. I can’t really tag a favorite here, although I thought that the White Russian Imperial Stout, with coffee and vanilla, was undeniably worthy of all the positive comments and huge popularity that it enjoyed while on tap (in other words, it was pretty damn awesome). Another popular brew is the Styrofoam Pony Stout (around 6% ABV), served in the tap room and around town. While the Belgian Pale Ale is the most popular beer that Aardwolf distributes locally and serves in-house, co-owner Preben Olsen explains that Aardwolf brews a mix of what’s popular and what the brewers like to drink, rather than focus on any particular style, origin, or type of beer. That said, I have found that the tap list has indeed grown with respect to beer styles, and Aardwolf recently introduced a very refreshing Helles Lager that’s sure to keep the “lighter” and more conservative beer drinking crowds happy. If you’re the adventurous beer type, not to worry: there’s no shortage of beers for your taste buds to experience an array of different styles and flavors. Aardwolf also brews up some traditional “old world” styles, too. Try The Pen is Mightier, a 4.2% ABV 80-shilling Scottish Ale, for a malty, toasty beer that you can repeat. You can even find a schwarzbier here, the Weltschmerz (easing the “world pain”), a 5.3% ABV, dark, malty and roasty beer that drinks very easy. On one of my recent bus tours, I persuaded one rider to try this beer (the “I don’t like dark beer” type), and as soon as she finished the taste test, her glass was raised for another (love when that happens!). Aardwolf has the IPAs covered for you hopheads, too, ranging from “regular” citrusy, piney IPAs to a session IPA to double IPAs. Aardwolf’s tap room isn’t a “sports bar” themed type of place, although there is a TV in the back room that is often used for parties. Generally, the tap room is a mix of the modern and the industrial, with a long main bar and ample tables and chairs, along with that ice plant brick wall that holds the beer menu. Behind that is a cozy and quieter separate room, that can be used for private or special events, with plush sofas and a view of the brewhouse. Feel free to bring food with you or order from a food truck on site or one of the nearby restaurants. Be sure to make a stop at Aardwolf Brewing when in Jacksonville! Next, we head to the beach! Stay tuned for a tour of the Jacksonville Beach breweries: Engine 15 Brewing Company, Green Room Brewing, and Zeta Brewing. And, there's also an up-n-coming brewery that's included, too (news of that one just broke, and I met with the co-founders for one of my recent posts; so if you're curious or haven't seen that yet, take a look). Hey, there are lots of events going on around Florida, so be sure to check out my BeerSPHERE™ Events tab and the "Tap This" Calendar tab! And, I'll see you at a brewery, event or beerfest around The Sunshine State.